From time to time, the Fairfield County Football League hears about various camp options available to youth and may forward information to members of the FCFL community. Our communication method is primarily email and we will also post the options under this area of our website in the form of clickable links to the flyers we have been provided by the organizations promoting the camp/event. Please understand that these are generally not FCFL sponsored programs. For camps that are available ONLY to the town you are registered to play in, we will post that info within the Town's individual websites. FCFL Towns are receiving a $50 discount off of the TERRELL THOMAS AND JOHN CONNER FOOTBALL CAMP at William Paterson University in Wayne, NJ on July 6-9, 2012. Use promo code “Team12” to receive this discount. Deadline is February 20th! Click the flyer below for more info or call 301-575-9400. CLICK HERE for Flyer or Download here: Brochure/Application. 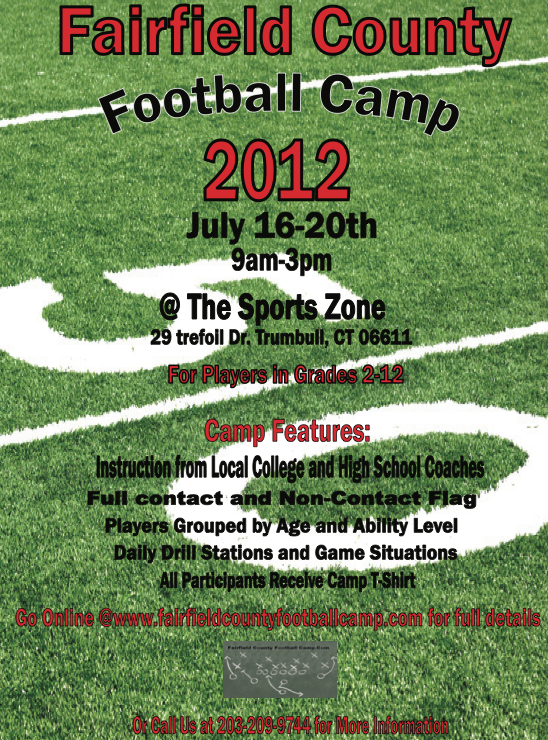 CLICK HERE for the www.fairfieldcountyfootballcamp.com website. The Joe Namath/John Dockery Football Camp website address is: www.joenamathcamp.com. You can also contact the camp offices by email at , or by calling (866) 626-2841.